The main branches of Judaism in the United States include the Orthodox, Conservative, Reform and Reconstructionist movements. But it is difficult to estimate the size of these movements globally because they are not familiar or relevant to Jews in many other countries; in Israel and elsewhere, distinctions are often made between Haredi or Ultra-Orthodox Jews, Modern Orthodox Jews and less traditional forms of Judaism. Geographically, Jews are concentrated primarily in North America (44%) and the Middle East- North Africa region (41%). 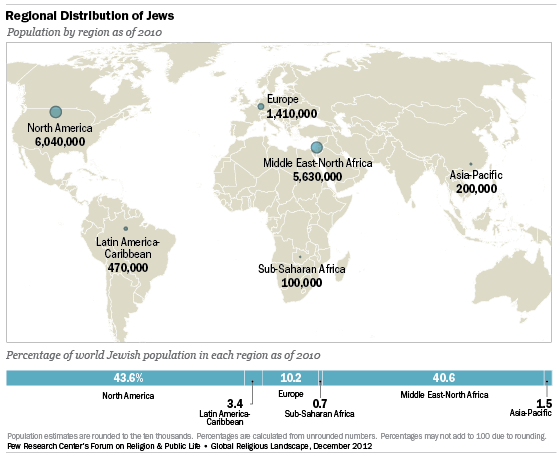 The remainder of the global Jewish population is found in Europe (10%), Latin America and the Caribbean (3%), Asia and the Pacific (between 1% and 2%) and sub-Saharan Africa (less than 1%). 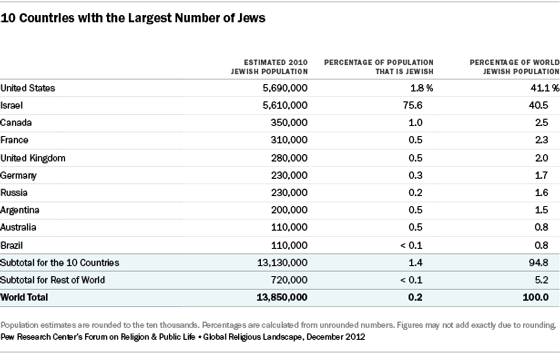 Jews make up roughly 2% of the total population in North America and a similar proportion in the Middle East-North Africa region. In the remaining regions, they comprise less than 1% of the overall population. While Jews historically have been found all around the globe, Judaism is highly geographically concentrated today. More than four-fifths of all Jews live in just two countries, the United States (41%) and Israel (41%). The largest remaining shares of the global Jewish population are in Canada (about 3%), France (2%), the United Kingdom (2%), Germany (2%), Russia (2%) and Argentina (between 1% and 2%). Israel is the only country with a Jewish majority (76%). 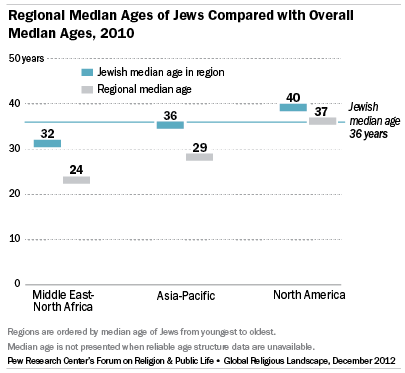 Globally, Jews are older (median age of 36) than the overall global population (median age of 28). Among the three regions for which data are available, the Middle East and North Africa has the youngest Jewish population, with a median age of 32, followed by Asia and the Pacific (36) and North America (40). Jews are older than the general population in each of the major regions for which data are available: the Middle East and North Africa (Jews 32 years; general population 24 years), Asia and the Pacific (36 vs. 29) and North America (40 vs. 37).